Don't miss the details of this ball featuring an Eagle with the United States Flag in the background! Hi. Unfortunately, this ball will not come drilled. You will need to bring it to your local driller to have the ball drilled for your exact measurements. 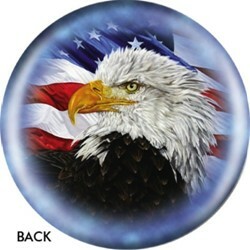 hello , do you make this freedom eagle pictured ball in the small candle pin size ? Unfortunately, we do not carry candle pin size bowling balls. Due to the time it takes to produce the OnTheBallBowling Let Freedom Ring ball it will ship in 1-2 weeks. We cannot ship this ball outside the United States.